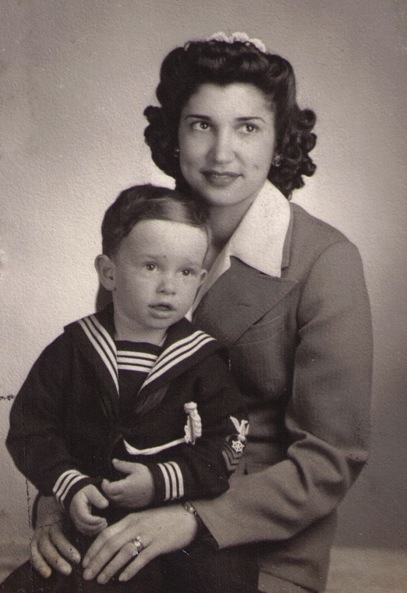 Joe, the young sailor, with our mother. When I was four, I was rescued by my older brother during a bizarre incident involving a mechanical bed in our house. Technically, there were two beds. One could be raised to sleeping level or lowered to the floor and rolled under the other, which was stationary. 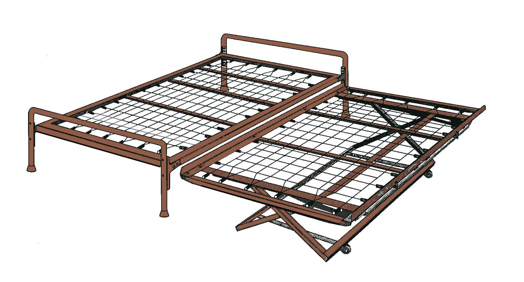 It may be known as a trundle bed, but we called it the high-riser. To me the name sounded futuristic, and just a little scary. The up-and-down part had a scissor-like contraption operated by a steel bar, which you pulled up and over the bed to raise or lower it. In a moment of incomprehensible carelessness, I somehow found myself lying face-down on top of the scissor bed with my head stuck under the frame of the stationary one. The bar was pressing into my upper back, pinning me to the mattress as if I’d been caught in a giant mousetrap. I still can’t imagine how I got myself into that position; it doesn’t even seem physically possible. But I remember yelling “Help!” in a muffled, pitiful kind of way, and thinking I might spend the rest of my life staring at the bedroom floor. My distress was compounded by the fact that pulling up on the bar would raise the bed still more, essentially decapitating me, while pushing down on it would have snapped my little neck. And then Joe appeared, somehow resisting the urge to do either and freeing me from my predicament with ease, and without a word. Sometime later he went into the Navy and was gone for several years. And then he was engaged. According to family legend, Joe had seen Noreen walking by one day and, as if right out of a 1940s Hollywood movie, said to his friend, “Frankie, there’s the girl I’m going to marry.” They did get married, in 1963, had three children, and moved into a house about ten miles from us, where we all gathered frequently for Sunday dinners and birthday parties. One summer day, when I was fourteen, while Joe was sitting on the deck of the swimming pool in their backyard, I sneaked up behind him and pushed him into the water. I either hadn’t noticed or didn’t care that he was fully dressed. As I said, I was fourteen, and boys that age are idiots. It seemed like a funny thing to do at the time. But when he climbed out of the water, he was saying something about his wallet and some important stuff in his pocket. Everything was soaked, including his driver’s license, which in those days was made of paper. I imagine that as he held the mass of soggy pulp in his hands, he would have liked to turn me into something similar, but Joe was thirteen years older than I was, and so had to show restraint. I remember hiding behind the pool for several hours afterward, marveling at my own stupidity, and my brother’s self-control. Several years later, when I was no longer fourteen, I did something even more idiotic. 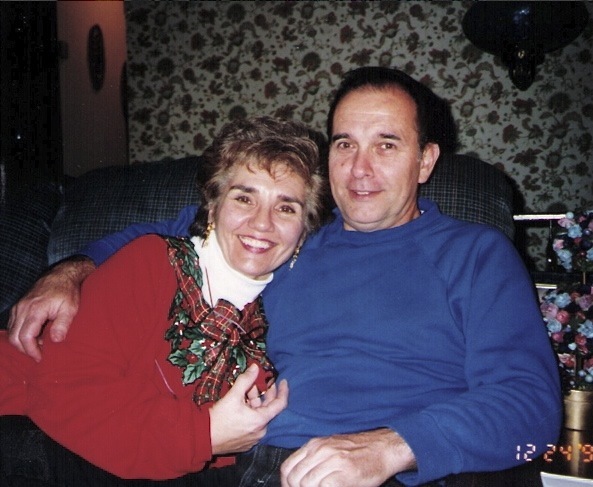 Joe and Noreen had gotten heavily involved in Marriage Encounter, a series of weekend presentations and couples-based communication exercises. One evening, with nothing better to do, I decided to disguise myself and go to their door pretending to be asking for charitable donations. I put on a long beard, a black coat and hat, and some old eyeglasses I’d found at home. Then, as my younger brother and sister hid in the bushes near the front door, I rang the bell and waited, hoping to fool Joe and Noreen with my disguise. It was difficult to see clearly, partly because it was getting dark, but mostly because I was wearing someone else’s prescription glasses. Everything was pretty much a blur. What I did manage to glimpse, though, was some motion in the living room window. I rang the doorbell again, and then heard the sound of screeching tires. A car that appeared to be the shape of a station wagon parked in front of the house and four large male figures got out and approached me. I pretended to mumble in a foreign language and tried to shuffle away, but they surrounded me and demanded to know what I wanted. Trapped, I removed the beard and glasses and explained who I was, and that I was just playing a joke on my brother. 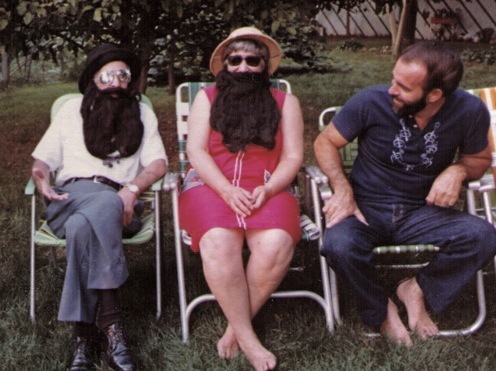 When my father and mother put on the beards, the incident became an official part of our family history. That's Joe on the right. As it turned out, Joe and Noreen weren’t home that evening. They were at a Marriage Encounter weekend. In fact, they were hosting the event. Their three kids, ages approximately nine, seven, and four, were with a babysitter, a girl of about twelve. It was she who’d peeked out the living room window. During the time I was reaching for the doorbell the second time, the babysitter was calling her parents just around the corner to tell them a strange man was outside. Now the front door was wide open and the babysitter, sobbing uncontrollably, was pleading to go home. I told her that I would stay with the kids, but they were all crying, too. They were confused, seeming to recognize my face but looking at me as though they couldn’t quite figure out what had happened to the rest of me. Someone called Joe and Noreen at the Marriage Encounter meeting and the next thing I knew, they were on their way home. When they arrived, Joe just looked at me and shook his head, and they all went into the house with hardly a word. My younger brother and sister followed me to the car, which we had parked a block away, and we drove home, also in silence. The incident wasn’t mentioned again. The following year, Joe and Noreen moved their family to Florida, following the promise of a new job for him. The first time they visited us in New York, they arrived unannounced, with Joe appearing at our door wearing the very same disguise that had backfired on me months earlier. The joke persisted in various forms for several years, with nearly everyone joining in at one time or another. It had come full circle, skillfully taken from annoying inconvenience to another bit of family lore, thanks mostly to my brother’s wisdom and sense of humor. I’ve always felt Joe’s presence, even when he was in the Navy, and then married and on his own. As a young boy I’d heard countless times how much I looked like him. He was my sponsor on Confirmation day when I was eight. An excellent pool player, he was the one who taught me how to hold the cue, and how to line up a shot. A great cook haunted by perfectionism, he made us pizza and cheesecake, which we all devoured while he bemoaned the sauce that wasn’t quite right or the microscopic crack that had appeared on one side of the dessert. A cannoli connoisseur, he learned to make his own, and mastered the process. He sent us all copies of our family tree, which he’d spent years researching. He is defined by his Christian faith, and by his love for family. Active and adventurous, he and his wife have traveled the globe during the past ten years. 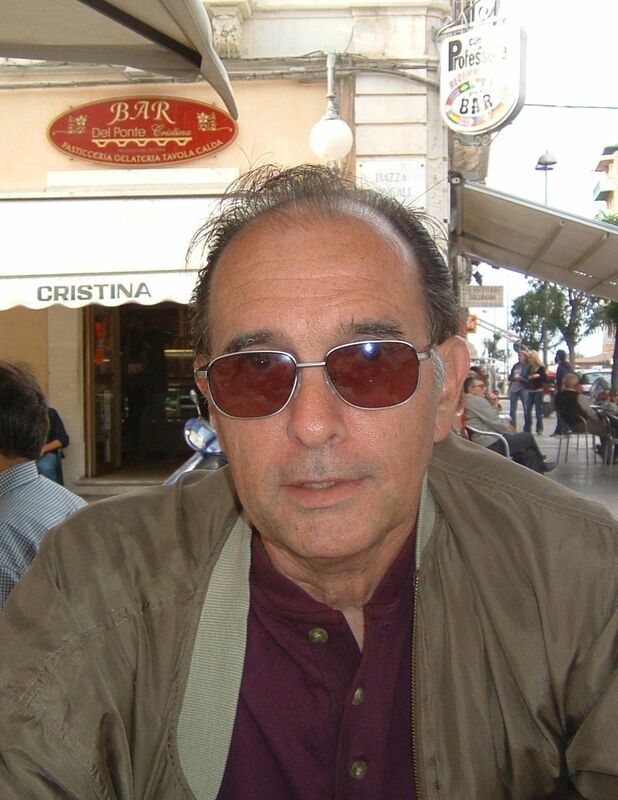 In Sicily, 2005, about to stuff his face with pastry. Joe has always been my role model in the aging process. And for the past two months, he has also been defined by the brain tumor that grew quietly inside his skull. It was removed several weeks ago, but the prognosis — if the doctors and their statistics are to be believed — is grim. Now, at the age of sixty-eight, my brother is in a battle for his life. I’m not a believer in prayer, but I hope for his recovery with a fervor that could easily be mistaken for praying. He has too much left to do, too many branches on the family tree to fill in, and far too many pizzas and cheesecakes to make. If there’s time, I’d even like to push him into a swimming pool at least once more. It’s impossible to know if any of that will happen. This good and loving man who signed up for military service during the Cold War’s most dangerous days has been caught in a giant mousetrap of his own. There’s a metal bar pressing against the back of his neck, and there’s no way for me to rescue him. But just as I don’t believe in prayer, I also don’t believe in statistics. I do believe in the will to live, the body’s innate and mysterious ability to heal itself, and the magic of hope. If you feel inclined to leave a comment here, I’d like to ask that you use it to send my brother and his wonderful wife a short and encouraging message. I know they would welcome your prayers, but if you prefer to offer simple good wishes, secret cures, mystical spells, breathing techniques, or voodoo incantations, that would be great, too. Whatever the words, I believe it’s the love behind them that makes the difference. Cancer seems to be everywhere lately. My good friends Cathy and Sarah are facing it now, as are the mothers of my friends Marie and Julia. For all of them, and everyone fighting this wicked disease, I hope for a complete recovery and years of health. And to anyone who has ever lost a sibling, I wish you the same inner peace that your brother or sister would want for you. Comfort and grace to you, Big Brother. I don’t know any voodoo or mystical spells, but I do know that God is not bound by statistics, the law of averages, or any prognosis given by doctors. I pray for healing and strength for you and for your family. And for peace most of all. The power of collective, worldwide prayer unexpectedly and miraculously saved my life at one point during my childhood. For that I owe an enormous debt of gratitude back to anyone in need. Joe and his family will most certainly be included in our thoughts and prayers. So many people have experienced miraculous recoveries and I’m confident that your brother will soon be one of them. Your brother sounds like a very special person. I’m so sorry he is going through this tough time. Rest assured he will be in my thoughts and prayers, as will you and the rest of your family. I’ll be sending good thoughts your brother’s way. He sounds like a great man! Noreen and Joe: while it might be odd to say this, one of the better things about finding out you have cancer is that the care and maintenance options are marvelous today. Doctors are making such progress. Statistics be damned. My first cousin is into his sixth year of survival after being told he had less than a half-year to live. He and his wife became one in faith and strength to recover. I wish you both a healthy dose of that same courage and resolution. Thanks, Uncle Charlie, for this! I had to read it in three separate segments because I was crying so hard. I would do anything to change this situation. I wish you all could be closer…the memories you shared are priceless ones! Small world story- my friend here in Florida (Victoria) lived around the block from us in Tappan and she was the babysitter of our babysitter, Terry, from that infamous night. Oh no! I forgot I was supposed to be writing this to my mom and dad! Joe and Noreen – I hope you enjoyed this stroll down memory lane as much as I did! I have to tell you that when I got to the words “microscopic crack”, referring to the cheesecake, I burst out laughing. That is classic “Joe” and one of the things that I love the most – our incessant desire for perfection that we all seem to have gotten from dad. My laughter quickly turned into an abundance of tears (classic “Charlie”) as I continued to read and thought about how much I love you two and how much you both mean to me. I can’t begin to tell you how much I love being a part of this family, with all the love and laughs, fights and faults. I would not change a thing about it, except maybe the part where we all move to the 4 corners of the continent, making it difficult to get together, and the part where we lose John. I know many people feel the same way about their family, thinking it is the best, but they are wrong – ours is! You know my beliefs about God, prayer and miracles, and that I trust God with my loved ones, knowing that He loves them even more and knows what’s best for each one. He truly is the perfect Father and He forgives our microscopic cracks (and the huge ones as well) and loves us even more than the best cheesecake on the planet (which of course, is yours, Joe!) So I know that He is taking care of you both, as you deal with this disease each day, and all the rest of us, who are dealing with it from afar. And I know that many of us are affirming Romans 8:28 right now. I love you! Philippians 1:3 – always. You paint a vivid portrait of what we’d all want of a big brother or sister…or to BE if we were the big bro or sis. This post was a labor of love and it must have been very difficult for you to complete. In case these wishes and positive energy can work miracles, I’m adding mine to what’s already bound for Joe and Noreen and all of you. You were lucky to grow up with such a wonderful brother. But he, too, is lucky to have you as a little brother, even if you were a devilish little puck! Joe sounds like a wonderful brother. Being an older brother myself, I read this hoping that my younger siblings could say such nice things about me. My thoughts and prayers are with Joe and all of your family. Cancer is a terrible disease, but the human spirit is strong. May Joe find strength, encouragement and grace for each day of his battle. Here is my share of prayers and thoughts of healing and recovery for your brother. Joe & Noreen: You don’t know me, but I am your sister in Christ. I’m affirming Psalm 103:2-5 for you, and I know you will be renewed according to the Great Physician’s perfect plan for you. Will continue to keep you and all your family in prayer, as I am well acquainted with its healing power. To Our Dear Friends Joe and Noreen. You know we are praying for you and hoping that the healing power of our Lord Jesus Christ will touch you both. With love and asking God to bless you always. Joe & Noreen–We’re beaming you good thoughts from New Zealand. You are probably getting lots of “advice” but if you haven’t heard of Vitamin C therapy you might want to give it a try. It can’t hurt and there are medical practitioners down here who swear by it. Also macrobiotics have helped a lot of people. All the best. Joe and Noreen – your brother paints a vivid and loving picture for those of us who haven’t met you. I pray that you know you are loved and that your life is, as it has always been, in the hands of the One who gave it to you. From one late coming baby to another, you shared lovely and real stories about your brother. To Joe and Noreen, and all the family, spend time on the good. If you keep that frivolity of life, I know you’ll have many more happy moments, and hopefully one more “dip” in the pool. But be careful about letting Charles babysit any of your kids. All my best to you. Blessings. Joe and Noreen ~ Even though I don’t know you personally, I “know” cancer. All of us do, for one reason or another. It’s a fearsome disease, and we reasonably fear it. But there’s something else I know. When cancer took my father 30 years ago, it often was poorly diagnosed and poorly treated. No one wanted it to be that way – it simply was. Today, the advances in both diagnosis and treatment are stunning. I live in Houston, home of the MD Anderson Cancer Center. There isn’t a more supportive, hopeful, and determined environment anywhere in the world. Those people know that there’s more to recovery and cure than chemo and surgery alone. I pray you’re surrounded by people who can provide that same hope and determined support – as it seems you are. Joe and Noreen: How we older siblings escape with our wits intact is almost inexplicable, right? 🙂 Even though Charles is twisting with guilt over his escapades (which are hysterical), I’m sure that you only look back on them as fond memories. Growing up Irish, our home was filled with as much love as yours, only we had little blessings and strange quotes for every circumstance life brought to us. A little “luck of the Irish” is a good thing to have and this Irish prayer has always brought me comfort throughout the years. I’d like to share it with you. Much love and hope for a speedy recovery. I am praying for a miracle for Joe, for peace of mind for Noreen and for faith for Charles. Lord Jesus, have mercy on us. Please grant these requests and give this loving family the strength they need to endure the challenges in their lives. Amen. Joe and Noreen – Both of you are being held in the healing power of God’s Love. As you accept and revel in the comfort of Universal energy, rest assured that it extends to all you love. I don’t know what I could possibly say that is more powerful and comforting than that. Dad, this is beautifully written. I was always curious about those beard pictures! Thank you for giving me, and everyone else, a glimpse into the past. Uncle Joe and Aunt Noreen, my thoughts are with you both every single day. I love you very much and know that you will find the strength and determination to overcome this obstacle. That was beautiful, Charlie. Thanks. What a wonderful brother, and wonderful memories of growing up together, my thoughts are with your family. The most treasured gifts are the memories we give to each other. Even in your pain, Joe, you’ve given your brother something that has no measurable value. You both are blessed to have each other. What delightful memories you two have shared. I have a feeling that despite what you are going through…that beard-wearing sunny disposition is shining through. My prayers are with you, Joe and Noreen. Embrace each moment. Live in gratitude. Laugh–a lot. Enjoy unexpected beauty. Tell the people you love that you do. Take time to dream, and to wonder. Cultivate your creativity (cheesecake, anyone?). Celebrate everything you can. May the blessings of peace and confidence that “all will be well” be yours. And if for some reason you are not cured, may you none-the-less be healed. Amen. Charles, as you make me laugh, you make me cry. Joe and Noreen, I send you hugs and healing. This weekend, I will ask for prayers for you from my Spirituality Circle. I’m at a loss for words at such a loving post. An X and an O to all. Joe and Noreen–Sending positive thoughts and prayers for you both from Texas. What a warm and wonderful family you have. This was very moving. My father suffered the same condition. My temporary cure for him was Humor. He loved to laugh. Everyone loves to laugh , even during such trying times. Wonderful story, and what a great introduction to Joe. Joe, I know you can beat the odds because you sound like a very special guy who’s always known how and when to beat the impossible, and I’m pulling for you to do it again. Hang on to the love, Joe. You’ll pull through that way. Hugs to you and Noreen, and to Charles and the rest of your family. I read this post last night, and was so moved I couldn’t even comment. And I’m not sure what to say now. But I do want to leave a wish and hope for a happy outcome. And encouragement for you and your brother. Sounds like you are there for him, like he was for you, more than you know. As an older sister, I know that us “first-borns” aren’t the greatest at expressing to the younger siblings just how much they are a part of us. We just assume they know it. Like the way your brother kept his cool (through those hilarious stories you mentioned). He did that because it’s a reflex. To protect you. Because he loves you. And I bet this post of yours meant the world to him. To see the same kind of love reflected right back at him. So much love in this post, and because it’s written by BB there’s humor too (the beard story is the funniest family tale I’ve ever heard). I too send my greetings and healing thoughts to Joe and Noreen.